The subject of peak oil and gas demand has recently risen to prominence. From concerns over ‘peak supply’ in the early 2000s, there is now debate over whether the demand for oil and gas is set to decline and, if so, when and how quickly. In its latest research report, the Abdullah bin Hamad Al-Attiyah International Foundation for Energy and Sustainable Development looked at a number of major forecasts that assumed there will be a slowing of demand growth, and a shift away from coal and oil towards gas and renewables, driven by demographic change, economic maturity, and environmental concerns. 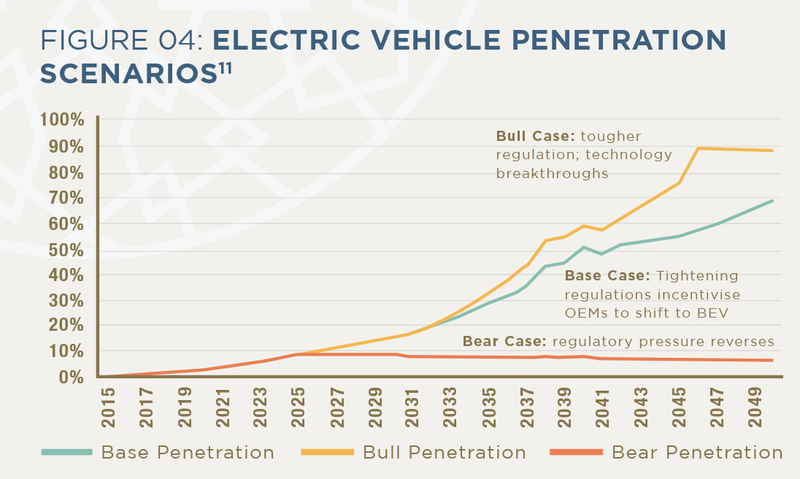 Most forecasts generally show rising but slowing oil demand up to 2050, but there are credible scenarios with a peak in the mid-2030s, driven particularly by electric vehicles (EV). Currently, passenger vehicles make up the single largest category of oil use, with road freight second. The IEA’s forecasts show that this remains true to up to 2040, in their New Policies scenario, but that the focus of growth shifts. The decline in energy demand could be driven by the adoption of electric vehicles, improvements in efficiency, and the substitution of gas by renewable energy. Underlying these trends is the connection between technological advances and a policy push from governments to reduce oil use, primarily because of concerns over climate change. If energy consumption was to peak, it would have major investment consequences for oil and gas producing countries and require urgent efforts at diversification. In the report, the Al-Attiyah Foundation analysed a number of leading energy organizations’ forecasts for future oil and gas demand including oil companies: BP, ExxonMobil and Statoil; governmental agencies: International Energy Agency, Energy Information Administration (US), and OPEC; environmental NGOs (Greenpeace); and consultancies and think-tanks: Wood Mackenzie and RethinX. All major forecasts show energy demand growth slowing down over time, as economies mature and become more oriented to services, population growth slows, and efficiency improves. However, none apart from Greenpeace and Statoil’s ‘Renewal’ case has an actual fall in primary energy demand by 2050. The main forecasts suggest about a 40% increase in primary energy demand by 2050, or around 1% per year from now on. In contrast, primary energy demand grew 2.2% per year on average during 2000-2016, despite the global financial crisis. No forecast identified show the opposite is possible, but demonstrated a continuation or even acceleration of energy demand growth, which might come from new technologies, namely: robotics, hypersonic flight, space travel, etc. Nevertheless, within a general trend of increasing energy demand, the distribution between the three fossil fuels and renewables can vary greatly depending on the scenario with nuclear energy’s share remaining at a fairly low and flat level in most scenarios researched. Except in very aggressive scenarios of environmental policy, oil demand is predicted to peak in the mid-2030s at the earliest, or more likely the 2040s or beyond. Petrochemicals, aviation and shipping, and road freight will support demand, while use in power and industry falls. The key uncertainty is the speed and size of deployment of electric vehicles (EVs). The share of EVs today is so small that predictions are very difficult. It should become clearer in the early 2020s; EVs will anyway take a significant time to penetrate the existing vehicle fleet. In summary, major oil producers and companies must watch carefully the competitiveness and deployment of non-oil technologies, including EVs but also battery trucks, LNG shipping and non-oil petrochemical feedstocks. Gas demand is more confidently predicted to continue rising, but it faces competition from cheap coal and cleaner renewables. Thus, it remains essential for major gas producers to continue improving the environmental performance of their fuel, and develop new markets.